morningstar_67 wrote: . i actually got in contact with a lady named mama_micki i haven't really talked to her much since so i don't really know whats going on, over there i did visit her ebay store but i saw nothing its just blank. :s I've visited 3 times by now? solo I'm not sure what that means if worst comes too worst then ill have to buy from the occult shop here in toronto until i can figure something out. i don't want a credit card cuz I'm not the best with money so… yeah… any other comments or replays would be very appreciated gracias. I recently received my order from Lucky Mojo, so I do have items for sale at my eBay store. I'm looking for US West Coast resellers. The closer to Northern California, the better. I tried Black Cat Root Shack http://myworld.ebay.com/blackcat-rootshack/ and Schreck's Mystic Emporium but eBay says "no longer a registered user" and Schreck's store "does not exist." Can someone provide current links to West Coast resellers? PM me and I'll give you my ebay store address. Mama Micki, is it all right if I PM you for the url as well? Go ahead and PM me, or you can search for me on eBay. Yes...Lucky Mojo products are fantastic...fabulous! For those of you within driving distance to me, you can order using coupon code HIGHDESERT to remove the shipping costs and then email to arrange for pick up or delivery (limited area) of your items. I only list Lucky Mojo items I currently have in stock. I am in Palmdale, California. I did a "Mirror Box" spell, follow the instruction of Luckymojo, it work. The 13 ritual bath worked magically. Thankful to Luckymojo and Mrs. Cat ! Do you have more information on this place? This seemed like exactly what I was looking for but google is turning up nothing except one page with a business license at an address that (according to mapquest) doesn't exist. Did you try this ink? If they are not on that list, then they are not authorized. Get a Post Office Box and find a good hiding place for your orders. Quick question. (I'll probably seem like a dunce, but.....) I have a wholesale account w/ Lucky Mojo & I'm getting my Ebay store up & running. Just did my first listing for some Special Oil #20, my shop name is "Mystical Philosophy." How do I do the "authorized reseller" badge on Ebay? And I think it's an EXCELLENT idea that you become ne too!! Still trying to get this eBay thing figured out but it gets easier with each transaction. Oh & to my UK friends I do ship globally. Is there an updated retailer list for 2014? There is this store in the town I work that carries similar products and I want to know if they are ordering from lucky mojo. I'm sure there are others but these are the only ones that I can vouch for from personal experience. As for my ship times I try to get it out the same day, but my cut off time is 4 p.m. CST because that's when my local P.O. closes. I hope this helps. Yes I have used mine before. You can call the shop also and ask or put the order in. We do accept debit cards -- in fact, i personally recommend them above credit cards to everyone. Gift cards can be used too but they need to have a registered address. Follow the instructions printed on the back of the card. Yes, that is what i said. Yes. Awww shucks. Thanks for the nice testimonial. That made my day. I have no idea how to start a new topic or how to find what i need to ask sorry im new. I tried to private message you it wont allow me and i tried finding the topic to which i wanted to ask is this site connected to lucky mojo?? That company is in no way associated with The Lucky Mojo Curio Co. The owner of that company has been trying to confuse the public for years. Id like to know where i can purchase LM Products in the Uk. I live in England. Are there any ebay sellers or online stores that sell them. Lucky Mojo does ship to the UK. There are also several retailers listed in this thread that also ship to your location. Have you contacted them? You could also contact the store and ask if they have taken on new resellers closer to you. I believe the list is updated periodically, so it wouldn't hurt to ask. Any UK stores/websites that sell LM products? I looked back and saw pagan-magic.co.uk used to but it seems they don't exist anymore.. But Lucky Mojo does ship pretty fast to the UK. I have clients in the U.K. that got their products in less than 3 weeks. May anyone know of an authorized reseller in NYC? I see there's a tab for NY resellers on the LM website but there doesn't seem to be information linked up to it! If it's not on the website then I don't know. I would like to ask if Lucky Mojo has any representatives or authorized agent who sells their products in Brazil. It would be way easier for me to get the oils I need from Lucky Mojo here in Brazil! Yes, you were on the wrong subforum and thread. I want to buys some products. Do you have any store in NEw york? or aany retailer in new york I can buy products from? Is any rootworker travelling to new york ? I would like to have a reading done. I can only pay in cash and so I cannot make any online order or payment. We do not have a store in New York or any retailer there. You can purchase directly from us with cash -- and many people do. Just be sure to add enough money for postage. We are currently updating our Resellers Page and, boy, does it have more resellers on it than it did last year at this time! I will post here when it is finished and revised -- and i predict that folks in this forum are gonna be highly surprised at some of the out-of-the-way places where Lucky Mojo products can be found! 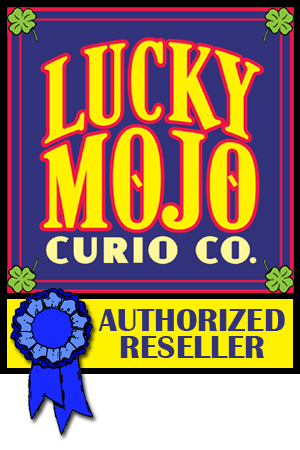 Thanks to all of our great wholesale customers who stock their stores and online outlets with Lucky Mojo products. The Lucky Mojo Retail Store Locator List has been updated for 2017! Thanks to Nikki, Leslie, and Heidi for keeping the database up to date and to Marcus and nagasiva for porting the raw information over into this web page. AND THANKS TO ALL THE SHOPS WHO CARRY OUR BOOKS AND SPIRITUAL SUPPLIES! I have a question and I couldn't find the best thread-- so I apologize in advance if this isn't the place for this question/discussion.. I use eBay a lot, not a lot but enough; and I noticed some LM packaging and some things that had "Lucky Mojo" in the title and description as well.. my question is -- Does LM sell products on eBay as well as the LM website? Lucky Mojo does sell to individuals in the states that do sell some Lucky Mojo products online, some sell more then others. I am not sure about every seller at ebay. They may be people selling items they own or authorized resellers, or they may be trying to get attention but not be selling real Lucky Mojo products. Lucky Mojo also sells wholesale to people with storefronts all around the country, so it may be worth a trip to the one in your state or a close state to see what they have. Dozens of companies make "Chocolate Chip Cookies," but only Tate's makes "Tate's Bakehouse Chocolate Chip Cookies." Dozens of companies make "Italian Biscotti," but if you are wise, you will only buy "Nonni's Italian Biscotti." Look at the label (font style, image, colours, etc.) -- that is the TRADEMARK. Read the text describing the product and its use -- that is the COPYRIGHT. Look at the name and address of the maker -- that is who made the product and who stands behind it. Compare products from various companies on points like price, quality, efficacy, and customer service outreach -- and i think that you will find that we at the Lucky Mojo Curio Company take our responsibility as spiritual teachers and helpers just as seriously as we take our responsibility as product makers, which is something that not every company can say. Remember too that when you buy from Lucky Mojo, you are also "buying" this free Forum and our free weekly radio show, where we will help you to become a home practitioner, or even, if your desire and skills lead you there, to become a professional root doctor -- and/or a wholesale customer who sells Lucky Mojo products at your own online or bricks-and-mortar shop. Just trying to understand the pricing here, are the retailers at the liberty to charge per their preference? Coz the price on the LM website is drastically different from the retailer here, so can someone please help me understand?